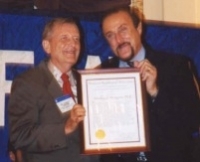 Saybrook University is thrilled to announced that PHS faculty member Stanley Krippner has been selected to receive the American Psychological Association’s Award for Distinguished Lifetime Contributions to Humanistic Psychology. Krippner, a past president of two APA divisions, is known and respected the world over for his pioneering work in “anomalous” areas that challenge mainstream paradigms. He has contributed significantly to the contemporary body of knowledge in dreams, alternative treatments of PTSD, human sexuality, hypnosis, and cross-cultural psychologoy. He is the recipient (in 2002) of the APA’s Award for Distinguished Contributions to the International Advancement of Psychology. Previous recipients inculude Clark Moustakas, in 2010, and Mike Arons, in 2008.